I call this the “Pajama Parade” because parade participants come dressed in their everyday clothes even their pajamas sometimes. Even though it has improved over the years, this is not the “Rose Parade” with fancy floats and carefully selected marching bands. 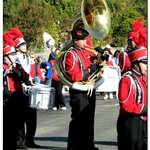 The Camarillo Christmas Parade is a parade for the community; it’s a great feeling to see people you know walking in the parade.